Fantastic bit of kit, even better when used with a power flush machine as it heats the chems and system water during the flush. Be careful with the vibra tool as sometimes the rad valves can pop off if they weren't tight in the first place. Love this. The engineering quality is brilliant, looks the business in front of the customer. Easy to use. On of the best tools I have bought in years. used this product for many years good piece of kit. value for money easy to use. only draw back is the case needs improved. simple features. Good build quality, easy to use and works brilliantly if you follow the ADEY best practise. Must have when flushing a system on an install job. Works brilliantly on its own or in combination with powerflush systems. Its satisfying showing my customers how much muck was in the system. Money well spent. Brought magancleanse, connected up with Powerflush or to use on its own. Tried and tested, amazing how strong the magnets are and how much crud they can collect in a dirty system! Customers are impressed and shocked at the same time! Purchased earlier this year to add to my powerflush kit. Brilliant piece of kit and works well on its own, had great results running on the old boiler before fitting the new one. Alex from Adey kept ringing trying to talk me into buying a magnacleanse unit. I did buy one. Used it once, didn’t do anything. Had to go back again and use my Fernox powerflush machine. Complained to Alex at Adey, she they will get their tech man to call me, to this day I haven’t heard from either of them. Avoid them. I won’t be using Adey again. Waste of money. Excellent product, does the job perfectly. Its priced at an average price. I think product could be made slightly better. Good piece of kit the magnets catch a lot of debris and If needed on a bad system you can leave it on for a couple of days before a power flush. Great bit of kit to have, bought mine from city plumbing as they had a deal on at the time. It does a good job of catching all the magnetic sludge in the system. Very simple to connect and go. Catches lots of dirt. Nice to show the customer what you got out the system. Easy to disconnect and fair price. Another great product from Adey. Collect’s the debris easy when combined with MC5 cleaner and the vibratool. Makes flushing easier and quicker not having to drain the system. Connect’s straight onto a magnaclean filter to start. Again highly recommend this product. Great magnets, makes work quicker, catches loads of crud, looks great, only issue I have is the amount of connections, loads of leak risks. Great bit of kit and really speeds up the flush whilst giving you a great piece to show the customer and prove why a flush was a good idea. Have used as a stand alone unit as well to help clean a system with flushing chemicals which has removed a fair bit on its own. Just like all the range, this brilliant bit of kit goes on every install and continues to be as good as day one. I am convinced that using the Magnacleans as well as fitting the Magnaclean filter is the reason I never get a call back to a dirty system water related issue on any of my installs. Brilliant bit of kit. There okay. It’s just one big filter. You should use with a power flushing machine just on it’s own you might as well just stick a filter on it. Had this bit of kit for a couple of years , straight forward to use, especially when you can’t use chemicals on a primatic cylinder, pulled loads of sludge out. Use sds vibration tools for better effect. Last job slight leaks on connections. Really good to cleanse dirty systems. Quite often leave in place of fitted filter to allow to clean system better. Only thing is valves/clips did tend to leak so remade them all. Great bit of kit to connect to filters and power flushing machine. Quality made hose bag and robust case for the magnacleanse. Well impressed with it. Fantastic bit of kit. Works well with or without power flushing machine connected to it. Would recommend the rad hammer to go with it as well. Great way of flushing system without power flush machine. Visible method of showing customer of how much sludge has been extracted from system. Easy to connect to existing magnaclean filter. Works brilliantly with or without being connected to a powerflush machine, captures debris on the first pass. Excellent piece of kit. The clear hoses are great for showing the customer the colour of the water entering and leaving the unit. Brilliant bit of kit, if only the case was made a bit better. Wouldn’t powerflush without them, really easy to set up and clean out. The best filter on the market. I use it with my powerflush machine. Customers love seeing the magnet covered in black sludge. Amazing product!!!! I use it with my power flush machine, cuts the flushing time down and then you can show the customer what you have gathered, they are all way happier to see what you have removed!!!! A fantastic piece of kit for performing a basic clean of a central heating system. The magnets really perform well to collect the sludge effectively. Use in conjunction with an Adey filter to provide great protection over the life of a boiler. Great bit of kit, the customer can see how much crap is getting collected. Also if fitting a filter great. Great when used in conjuction with powerflushing machine or even as an alternative cleaning method to powerflushing. Amazing bit of kit for flushing systems. Great to see just how much sludge they catch when used with their cleanser. Really easy to use when there is a magnaclean installed. Brilliant bit of kit. Easy to use great for installers.able to show customer how much dirt it gets out of system. Not cheap but worth the money. Customer can see what has been removed. Works well on its own but better with power flush linked up. 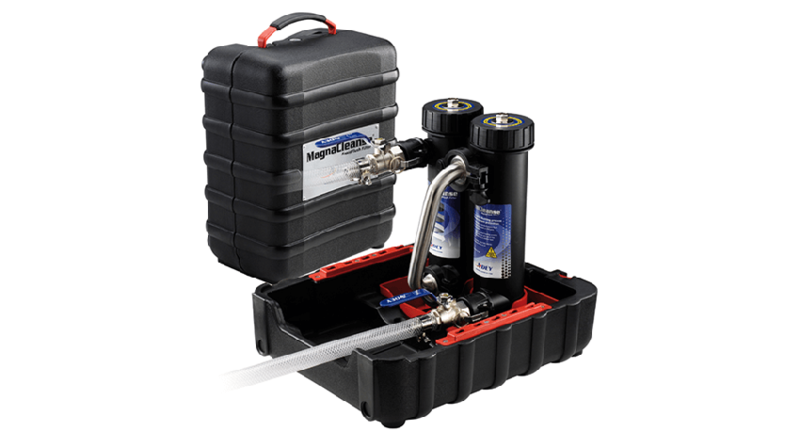 This is a great bit of kit to either use with your power flush machine or to carry out a flush on its own. It makes a real difference and is a must have bit of kit for any installer. Great bit of kit to have on the van, works well on its own and even better with a power flush machine linke up to it. A must for a boiler installer. This is a must have for any heating company. Every now and then you drain down a system that is a lot worse than you think and this bad boy will sort it right out. Helped us out many times. Fantastic bit of kit, great way of putting the customer at ease as some think a proper flush is a rip off. Smyou can actually show them what you've pulled out of their system! Been using this product for a few years now and when connected to the powerflush machine the dirt in the system has no chance. I would urge anyone who powerflushes to get one. Had this for two years, found it to be a great product on its own but wouldn't use it without a pump on an open vent. I have adapted it to connect my ancton pump. I always offer an adey magnetic filter which makes flushing easy with the easy kit. Really enjoy using my magnacleanse in conjunction with powerflush machines. Well designed and super strong magnets. Does what it says on the tin. I use it in conjunction with my flush machine for a quicker job. No issues with bits leaking etc my only gripe is the casing doesnt stay closed very well a slight knock and the case comes apart due to it only using lugs. I love this kit, it been a great addition to my Kam o powerflusher. Great results and got at a decent price too. Bought this about 4/5 years ago and it has definitely paid for itself over the years. It's great to be able to see and show the customer what has collected after cleaning the system. I couple this with a Fernox powerflushing machine and the results are brilliant. One of the best purchases I have made for my business. To be fair all I can say about this is how amazing it is, a MUST have tool for any engineer! Simples! Excellent. Easy to use and very effective. Straight out the box it got to work very quickly easily connecting to magnaclean pro. Love this peace of kit great for power flushing Easy to use just dont understand how the jubli clips keep the flexi hoses attached. I think this is a great addition to a powerflush machine and seems to remove most of the crap found in dirty systems. I used the first Magnacleanse and had issues with them leaking, I then upgraded to the newer one and it is much better. For collecting sludge it is unbelievable on old systems. Not as good on systems with plastic pipes. All in All amazing piece of kit. Great piece of kit, does what is says and always nice to show the customer what comes out of the system. Carry case a bit temperamental. Works excellent with magnaclean filters just fits straight on the the magnaclean unions. Great for powerflushing, saves on time and water and provides a good visual aid to the customer of how much debris you are taking out of the system. I've seen that they've upgraded the box to include a catch so i will be getting one of those. I also need to replace the camlocks as they leak. It's a shame as i used to leave it inline at the customers house with cleaner in and return the next day. Great piece of kit. And works well, if I had one critique it would be the box , maybe a catch to hold both halves together . That being upswing this product stand alone or Inline , it works a treat ! All in all an essential piece of kit . Excellent kit easy to use and set up with the Magnaclean Pro filter. The clear tubes give you the opportunity to show the customer the black water entering the Magnacleanse and leaving the other side clear and clean. Absolute brilliant price of kit. I sometimes use it alone or in conjunction with my powerflush machine, it works really well both ways. It's great to be able to show the customer the end result of what was in the existing heating system. I use this on every boiler install, it's a fantastic product just like there filters. Would recommend it. Saves time on flushing, easy to use, pays for itself in no time. This is by far a lot easier to use & a lot more effective than power flushing even on its own - can be used in conjunction with power flushing. I sold my powerflushing machine and have now made these a permanent feature on my heating system. They are absolutely awesome for removing sludge! They use to drag sludge out of the cleanest of systems! 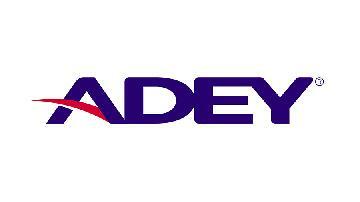 ADEY filters in my opinion have always been more successful than their competitors. I've got the earlier model and it's still going strong, but it didn't come with The hoses. Great bit of kit and it not only works well, you can show the customers how mucky their system was. Grreat results using this system, backed up by sending water samples off to Adey for testing. Only gripe is that hose connections onto the filter can leak. Good bit of kit, had mine for a good few years now. Great. It if kit when used in the right situation. I dont relise how i coped with out it. Revolutionised power flushing, great bit of kit. Probably the most profitable tool ever, paid for itself with one job. Great tool and should definately be part of any engineers kit. The magnets are very powerful and guarantees results every time. Very good product easy to set up brilliant results.